Scribblenauts Unmasked aims to tap into the goofier side of superheroes. One of the prevailing notions that have dogged comic books and their readers for decades is the belief that comics are merely kids stuff. Granted, in their early days comic books were primarily for children but as the years have gone on they've grown more and more adult, to the point that there are more than a few running books most parents would probably want to keep their kids away from. Even in the realm of the DC Universe things can get a bit M for Mature at times. Scribblenauts Unmasked: A DC Comics Adventure, on the other hand, is aiming to keep things in the E for Everyone range, even if it means skipping over some of the darker elements of the DC Universe. "There are some characters we couldn't include because they are more mature DC characters," said Joseph Tringali, general manager of 5th Cell, the studio behind Scribblenaunts. In turn, Unmasked will be tapping into some of the sillier sensibilities that have, at times, governed comics and superheroes. "If you go back to the campy 1960s comic book TV shows where there's the onomatopoeia and the different sound effects. It's not dark or bloody or gratuitous." While the idea of excluding perhaps beloved characters will probably rub some the wrong way, 5th Cell's desire to keep Scribblenauts kid-friendly shouldn't come as much of a surprise. The franchise has generally kept things pretty clean and really, a quick glance at Unmasked should be enough to understand that it's not aiming to emulate the grimmer face of comics. Still, you have to wonder who the game will be leaving out. Most would consider the Joker to be on the dark end of the DC spectrum but he'll be in the game. 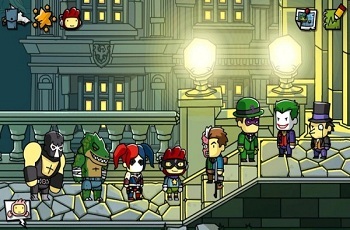 If the Joker gets a pass, then who's too adult for Scribblenauts?